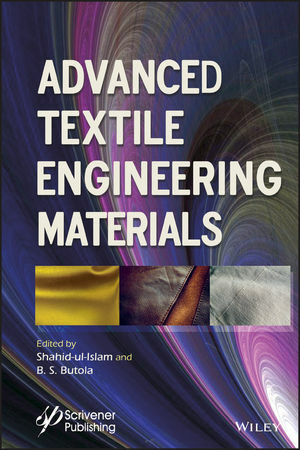 Advanced Textile Engineering Materials is written to educate readers about the use of advanced materials in various textile applications. In the first part, the book addresses recent advances in chemical finishing, and also highlights environmental issues in textile sectors. In the second part, the book provides a compilation of innovative fabrication strategies frequently adopted for the mechanical finishing of textiles. Shahid-ul-Islam received his PhD in Chemistry from Jamia Millia Islamia (A Central University), India, in 2016. He then joined the Department of Textile Technology at the Indian Institute of Technology Delhi (IITD) where he is currently DST-SERB National Postdoctoral Fellow. His research interests include green chemistry, dyes and pigments, thermodynamics and kinetics of colorants, and textile finishing using polymeric nanocomposites. He is a recipient of several academic awards and competitive fellowships. He has published numerous peer-reviewed research articles in journals of high repute as well as edited 3 books with Wiley-Scrivener. B. S. Butola obtained his B. Tech. (1990) and Ph.D. degrees (2005) and is an Associate Professor at the Department of Textile Technology, IIT, Delhi. His research interests include functionalization of textiles with metal oxides, use of shear thickening fluids for improving the impact performance of ballistic textiles, polymeric nanocomposites and smart colorants.